A bit of rain first thing and then basically it cleared up. Still a nice London summer at 22 – a bit of a change from last week. Carole came with us as we headed downstream on the Thames to check out Greenwich. 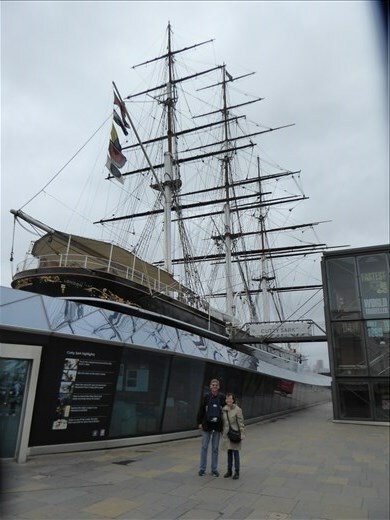 The Cutty Sark (the fastest sailing ship of the late 1800’s) has been restored in dry dock to its former glory. Standing on the deck it was scary to think of the sailors climbing up to the top of the rigging at 47m. They had an actor in costume talking about the times and she was great. There was a huge collection of figureheads in the enclosed area under the boat. Then off to a pub which used to be a brewery where we managed an enormous roast complete with Yorkshire pudding. Waddled out of there and headed up the hill to the Royal Observatory where there was a walk-through display of how it used to all work with instruments and time pieces and then took our photo with the obligatory one foot either side of the Meridian. This also was an interesting museum and well displayed. Wandered back down to the waterfront where Carole took us to a tunnel built in 1902 which enabled you to walk under the river. So, we went down to the bottom and checked it out but came back up on the same side as that was where our ferry was. Floated, at fast speed, back down to Waterloo and headed home.